Brick and concrete, also referred to as hardscapes, are great outdoor materials due to their longevity. However, improper or aggressive cleaning can damage and decrease their lifespan. So it is very important that you do proper maintenance for them to last a long time. With a few simple steps, you can keep your outdoor spaces clean and well-maintained. Clear the area of toys, vehicles and other things that might get in the way of pressure washing. Attach the garden hose and the 25-degree nozzle. Turn it on and give the area a once over to remove loose debris like pebbles, grass and any small tree leaves or branches. Apply detergent. Read the machine’s manual to know which are the recommended cleaners to use with your particular washer. Don’t forget to attach the soaping nozzle as this is designed to soak the area as opposed to blasting it clean. Let the detergent work on cleaning the area for about 5 minutes before the high pressure wash.
You are now ready to blast all the stains, grime, mildew, and other dirt. A surface cleaner attachment is the recommended method as this will complete the cleaning faster and better. 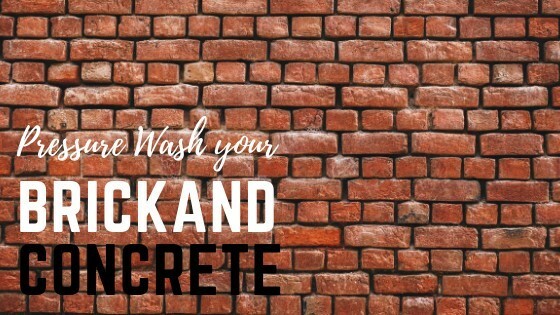 That is because it disperses the water over a larger area, reducing a risk of concrete damage from high pressure as well as pulsing the flow to more readily tear the dirt and grime from the surface. A surface cleaner can cost around $20 to $2000 depending on the size and material. They come in plastic or stainless steel. Use a rotary nozzle to remove very stubborn stains. This does a similar thing to the water flow as a surface cleaner. It rotates the flow of water to greater push and peel the dirt and grime from the surface. The surface is now ready for the final rinse to flush away the detergent. Attach the 25-degree nozzle and start rinsing it thoroughly. Use your most delicate spray nozzle to soak the area with water. You’ll have to do this to get the entire brick surface wet so it won’t absorb the detergent. Apply the proper detergent with the proper nozzle. Ensure you cover the entire surface. Let it work for about 5 minutes but you need to ensure that the entire surface is wet the entire time. Attach the 25-degree rinsing nozzle to remove all dirt, grime, mildew, and detergent. Important: Use more detergent but less pressure as it may destroy the mortar, which is somewhat strong but still the weak point in a brick area. Still unsure how to proceed? Let the professionals do it for you! Give us a call and let’s clean it up!